Flight Attendants in the United States & GUM who fly on U.S. 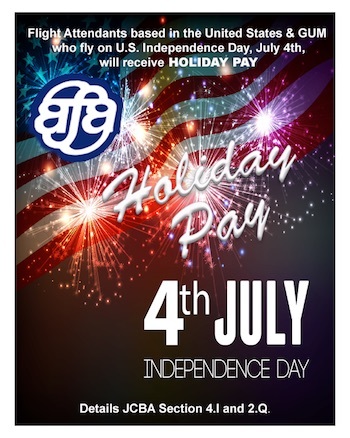 Independence Day, July 4th, will receive holiday pay as calculated using the formula outlined in Section 4.I. Additional information, including the formula used to calculate holiday pay can be found in E-Lines publication dated June 26, 2018.